Yesterday, August 2, 1876, James Butler Hickok, also known to friend and foe as Wild Bill, was brutally assaulted and murdered in the Black Hills mining town of Deadwood, South Dakota. At 4:15 on that horrendous day Hickoks attacker, the notorious gunslinger known as Jack McCall, and also referred to as Broken Nose Jack, entered the No. 10, or possibly the No. 66, Saloon where the now-deceased was innocently enjoying a friendly game of poker with friends. Unbeknown to one of Americans most famous heroes of the west the bloodthirsty McCall, with no known provocation, entered the saloon where the peaceable Hickok sat with his back to the saloon door. McCall then slipped up behind Hickok and shot him in the back of the head with a heavy .45-caliber Colt, serial no. 2079, killing Wild Bill instantly. After having murdered James Hickok, gunslinger McCall then attempted to assassin others in the saloon. Ironically, the remainder of the cartridges in McCalls pistol were reported to be duds, however it is believed that one other man was hit. At the time of his murder, Hickok, who never had a chance to defend himself nor see his assailant, was holding a draw-poker hand consisting of an ace of diamonds, an ace of clubs, one eight of clubs and an eight of spades. In addition, Hickok also held the Queen of Hearts. At this writing a hand consisting of these same cards is already being referred to as the Dead Man's Hand. This hand was witnessed and verified by a Mr. Christy, a friend of Hickoks who was present at the time of the murder. Also ironic, in view of reputation and past heroic deeds of the deceased, James Hickok died with his Smith and Wesson revolver secure in its holster. Hickok first graced the fair city of Deadwood, South Dakota in the spring of 1876. Shortly thereafter he became a welcomed regular at the poker tables of various Deadwood saloons. It is believed that at the time of his death Hickok, who had only reached his 39th year, was a full time-employed card player. James Butler Hickok was born in Troy Grove, Ill., on May 27, 1837. In 1855, after some disturbance, he left Illinois. For a time, thereafter, he turned his hand to farming. Sometime later, Bill joined General James Lane's Kansas free-state force. Hickok became a law officer for the first time at Monticello, Kansas. He also served as an Indian scout and drove a stagecoach on the Santa Fe and Oregon trails. During the Civil War he served his country as a Union scout. In 1866, Hickok became deputy marshal of Fort Riley, then marshal of Hays City in 1869. His law-enforcing career continued in Abilene in 1869 where he also served. 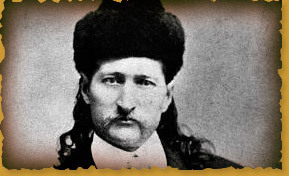 In 1872 Hickok had a two-year stint in the entertainment business as a performer with the famed Buffalo Bill Cody's Wild West Show. However, in 1876 he left the show to seek his fortune in the Black Hills in Dakota Territory during the gold rush there. Mr. Hickok will certainly be mourned by his many friends and associates. Among them, and famed in her own right, is Martha Jane Canary. Better known as Calamity Jane, Miss Canary is an expert horsewoman and sharpshooter. Though notorious for the wearing of mens clothing it is often speculated that Calamity utilizes her often hidden feminine charms to support her various, and sometime liquid, necessities. However, the town of Deadwood still gives thanks to Miss Canary for her unfaltering assistance during the smallpox epidemic that devastated that mining community. At the time of this writing, it is assured that gunslinger Jack McCall will stand trial for the murder of James Butler Wild Bill Hickok. There is little doubt that the results of McCalls trial will be a sentence of death by hanging. Though our artist, Mary Trotter Kion, was not present at the shooting, the Great Plains Gazette would like to present the above ink and pencil sketch of how the murder of Wild Bill Hickok may have taken place. Kion says all you pardoners out there are welcome to use her sketch, just as long as you let folks know who drew it. Better fess up if you use it, she can be pretty quick on the draw herself. Mary also says she's sorry the sketch is so small and guesses she'll have to use a bigger pencil next time. Edwards, Shane. Heroes and Outlaws of the Old West. Published by Santa Monica Press, Santa Monica, California, 1993. Breihan, Carl W. Great Gunfighters of the West. Published by Signet Book, 1977. Reiter, Joan Swallow. The Old West: The Women. Published by Time-Life Books, Alexandria, Virginia, 1978.